So if you look at the blue VIN plate on the left hand (facing the car) side of the engine bulkhead, there are two long alphanumeric codes. The one on top is the "chassis number" (which has "BCNR33-0XXXXX" - showing the actual "serial number" (ie its unique ID, numbered according to what series car it is) and the one below that, the "model number" - which is a few digits longer, and starts with a "GG." 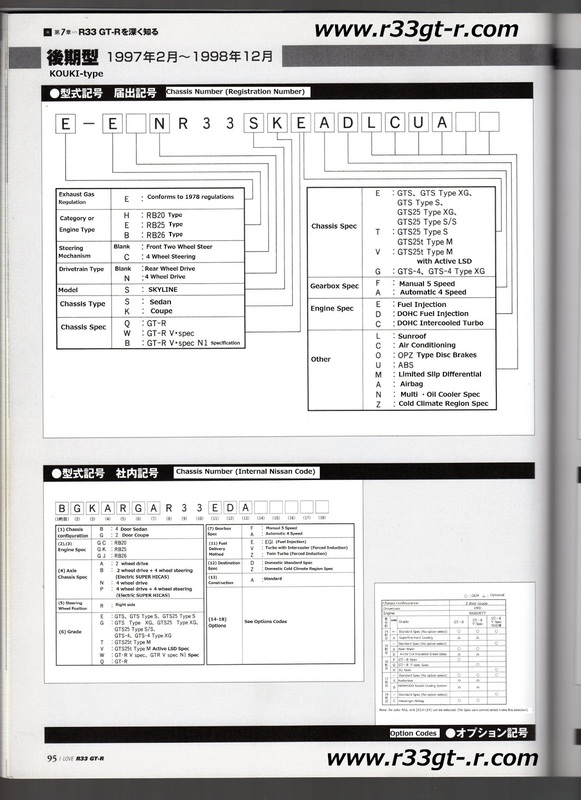 Note that this is also only for the Kouki (Series 3) model - the others had some slight variations. 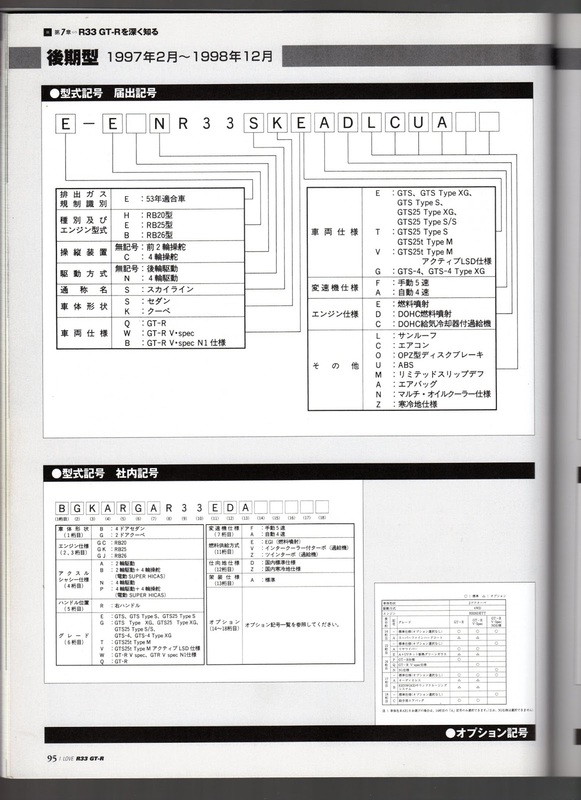 And actually - it's the bottom half of the page which is useful if you are looking at the blue plate in the engine bay... the top code is what is used to register the car with the Japanese authorities, so would be listed in the car's Shaken-sho. What's most interesting are the options (the few) that were available for the car (the small box to the right on the bottom). A KENWOOD Sound Cruising System, anyone? 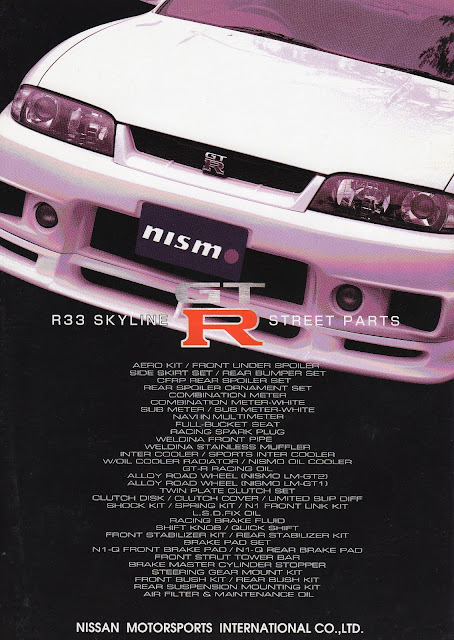 The BEST NISMO Parts Catalog? At first, I wasn't too excited. 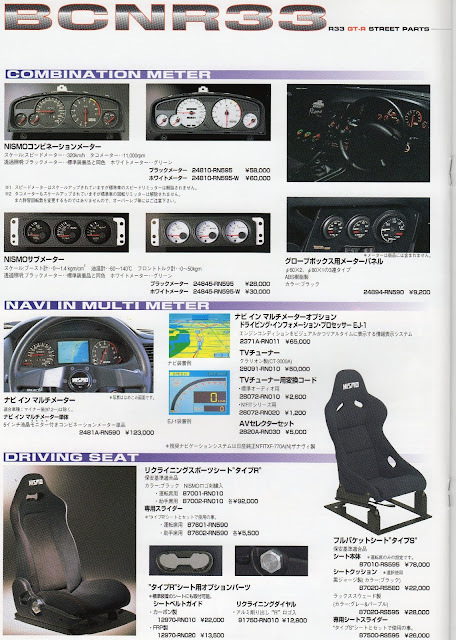 But then I realized that this catalog was published after the 1997 Series 3 cars came out. Honestly I wasn't expecting anything new, as NISMO tends to upgrade their product offerings very slowly. But one page grabbed my attention (click HERE to see all the pages). First, I had no idea that NISMO had offered a gauge panel for the glove box, as above. However, I'm not a big fan of driving around with my glovebox open, so this was interesting but probably not something I would buy even if I came across it somewhere (if they even exist now?). The "Navi In Multi Meter" I have seen before on Yahoo Auctions. Tempting, except that the this instrument panel is not exclusive to the GT-Rs and so it doesn't have the GT-R logo, for one. Also, GT-R nerds like me, appreciate how the speedometer needle is horizontal at rest, and the tach needle points straight down. Plus, the redline of the tach is at 7000rpm, and you lose the oil pressure gauge. Again not designed for the GT-R. Too bad. And finally that cool aluminum billet seat reclining knob. A small dress up item, but it would definitely add to the stark interior. 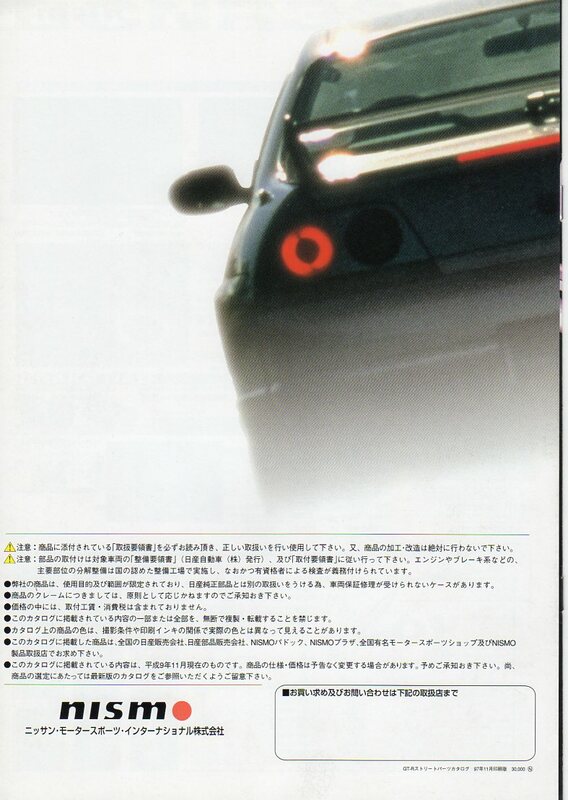 So here is the back cover of the catalog - one of my favorite shots, it really differentiates the Series 3 from the other other R33 GT-Rs.